Want to watch basketball like a coach or scout? Here's how I learned. One day in June of 2012, the Portland Trail Blazers’ offices were abnormally quiet. It was only a few weeks before the draft and we had two lottery picks, so the previous few weeks had been a whirlwind of activity, with draft workouts and long meetings. But on this day, all the scouts and executives were out on a scouting trip. Well, all except one: One of our assistant GMs, Steve Rosenberry, stayed in Portland. And I was the beneficiary. When Rosey walked in that morning he came straight over to my desk. “Benjamin,” he said. “Let’s watch some tape today.” Rosey told me which games he wanted to see and went to grab breakfast while I downloaded them. I think he wanted me to watch with him in part to handle the technical side of things—to get the games, to put them on the TV, to rewind and skip when needed—so he didn’t have to worry about it. But even though I had some work to do, I would have done the same thing 10 times out of 10, because it turned into a scouting masterclass. Rosey isn’t exactly a silent scout. When something notable would happen on video, he’d make a comment (frequently sarcastic) and ask me to rewind so we could watch it again. I noticed some of what he’d point out before he said anything. But most of it was eye-opening. I got the opportunity to see what he saw, to learn from someone who had been around the game for decades. In future years we’d repeat this ritual, and I’d look forward to it in every draft prep cycle. My involvement with the coaching staff under Terry Stotts provided similar opportunities. I would sit in on all of the coaches meetings, and learn from what they discussed and debated, diagrammed on the board, and questioned. But I learned the most from the film review. An assistant coach would have been tasked with pulling clips to go over with the players in the film session that morning. Terry would put in his own clips. We’d review all of them as a staff, talk about them, and Terry would decide what he wanted to keep or cut. I specifically remember a meeting early in the 2012-13 season when it was apparent just how much I was going to learn in these meetings. One of the coaches had pulled a clip of our offense that ended in a tough midrange pull-up jump shot. “Bad shot selection,” I thought to myself as we all watched silently. But when Terry spoke I did a double-take. “That cut killed the play,” he pointed out. What was he talking about? I didn’t even notice an important cut. He had our video coordinator rewind the play. The set called for a cut off a screen by one of our wings to start the play, but instead of sprinting off the cut, the player just went through the motions. “If he just jogs like that, the defense isn’t pulled over and the next action has no chance,” Terry explained. I hadn’t even noticed that cut. It happened a while before the eventual shot and seemed like the kind of cut NBA players make thousands of times per season. But to a trained eye, it was the key to the play. I was unbelievably fortunate. Before I was in the NBA, I had been struggling to find resources to learn X’s and O’s, to understand scouting, to see the game the way those inside the game saw it. Now I was inside the game. I could sit with those who had been studying basketball for decades and learn at their feet. But very few people get that opportunity. What about them? How can someone outside the game learn to watch basketball the way a professional does? I heard Pat Riley say this 16 years ago: “Until I watch the film, I really don’t know”…I just made my notes in there about what I think will happen…When I watch the film on the plane, half of it will be wrong. If Steve Clifford and Pat Riley can’t analyze the game without film, then you shouldn’t feel bad for not picking up on important aspects of the game when watching live. If you want to analyze and understand the game, you should follow their example: watch the film. There are two reasons to watch a game: for entertainment and to learn. Sometimes you can do both, but it’s very difficult. Watching live with no (or infrequent) rewinding, with other people around, or while on social media makes the game more fun. But those factors also make it really hard to learn. When I worked for the Blazers, I would watch every one of our games twice. Once live, so I could experience the emotional ups-and-downs of the game, and once on tape so that I could understand what caused those ups-and-downs. Now I’ll watch only the most anticipated contests live. I can’t do my job without being able to rewind and study. That is the most important step: figuring out how to watch in a way that makes it easy to rewind. The simplest way to do that is to use a DVR. Fair warning: this will require a lot of jumping back and forth in a game.1 Anything that makes it difficult to jump back a few seconds will make you less likely to rewind, and you don’t want that. So determining the best setup for you is important. As an example, the online version of League Pass has jump back/forward buttons for 20 seconds at a time. That is way too far to jump back for that to be consistently useful and not make you feel like you’re wasting time. That kind of impediment will make you go back less often, and you will miss things. I will sometimes jump back in the same play three or four times to fully understand what happened. Making sure you can do that easily is very important. Once you have the file on your computer, you can use free software like VLC player to watch the video. VLC is helpful because you can assign keys to easily jump back and forth or watch in slow motion. For example, I have keys set to make it easy for me to jump backward or forward by intervals of two seconds, 10 seconds, and one minute, as well as to watch frame-by-frame. Watching the game itself is a necessary first step. But once your questions have been sharpened, you can use tools that show specific groups of plays to get more targeted answers. The NBA.com video tools (which deserve more publicity) allow you to do this. For example, they allow you to watch all of the three-point attempts from Game 7 of last year’s Houston vs. Golden State series. Acquiring the film in a form that allows you to pause and rewind is a necessary first step. From there, it’s all about approach. The approach I follow is one I learned when I first got my start in the basketball world. I was working for Dean Oliver, one of the leaders of the basketball statistical analysis movement, watching film and tagging each play according to a certain system. The work I was doing was monotonous, but it was very instructive. I broke down each play at an elemental level, watching to see what caused the outcome and tagging it appropriately. It trained me to think through the game, to watch each play and ask why? I would recommend the same approach when you watch film. Watch to see what happened on a play—say, a wide-open three, for instance. Then rewind and watch again, this time trying to identify why the player was open. How did the defense move? Why did it move in that way? What were they supposed to do? One trick is to watch for player and coach reactions after plays, or listen for mics picking up their conversation. With a little guesswork, you can learn a lot about what they expected to happen. Then think through the strategy of it all. Would you have done it the same way if you were playing or coaching? Or would you have tried something else? Then put yourself in the other team’s shoes. How would you counter your own counter? Do this analysis often enough and you start to see patterns, and those patterns help you pick things up faster on each subsequent viewing. The game can be learned without knowing these patterns, but it is much more difficult. When you have a framework upon which to layer what you’re watching, your understanding grows much more quickly. What are those concepts? Some are more basic, like a pick-and-roll or a pin down. Some are more complex, like a single-side tag or short action. Learning these patterns takes time, but it is certainly possible. When I was starting out in the mid-2000s and wanted to learn more about the game, there wasn’t much I could find. But a decade later there are now lots of great resources, whether that’s following coaches or analysts on Twitter or watching breakdowns or coaching clinics on YouTube. 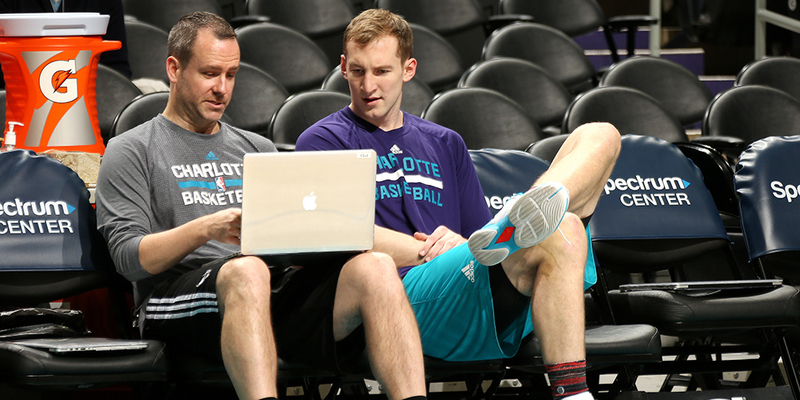 Technology has begun to democratize basketball knowledge. One of my goals when I launched Cleaning the Glass Insider one year ago today was to continue that process. With articles like Feature Film, midseason review scouting reports, and Watch With Me, my hope is that you can learn by example: You can see the kinds of things I’m pointing out and start to look for them yourself, just like I did with Rosey in Portland. In the future, I hope to continue sharing that knowledge, putting out a more comprehensive guide to specific terminology and actions. But I will also say this: One of the reasons I love basketball is it feels like there’s always more to learn. There is so much depth and complexity to this game, you can dig and dig and dig and never find the bottom. So much of the fun isn’t even in the knowing, it’s in the learning. And, if you do it right, that learning will be a life-long process. So don’t just rely on others. Do the digging yourself.